Last weekend Jacob and I left Flagstaff on a beautiful Friday morning and headed to the Grand Canyon. I don't have class of Friday and Jacob gets out at 8:50 so we took the opportunity to head over to Desert View and start down the Tanner Trail. We'd never been to this part of the Canyon before, outside of spending a cold November morning on the rim by the watchtower a few years ago with my parent over Thanksgiving, so we were stoked to see what this section of the Canyon looked like. We rolled into Lipan Point parking lot a little after 12:30 (later than we hoped but we needed to get a parks pass at REI - a great $80 investment), got our stuff together and took off down the Tanner Trail around 12:45. The first couple miles of trail was steep and rugged and since no fastpacking had happened over the last few months, the packs felt a bit cumbersome. Anyhow, the day brought bright blue skies and near perfect temperature as we descended. After two and half hours we made our way to a shady spot along the river and stopped to have a short snack and contemplate our plan for the rest of the trip. The option was to head upriver along the Beamer Trail or to continue downstream along the Escalante Route. Looking at the map we saw that the Beamer Trail would lead to the confluence of the Little Colorado with the Colorado River. This is a place we both wanted to explore, but we opted to head the other way as there was a few more options. Heading downstream the New Hance (Red Canyon) Trail climbed back up to the rim 7-8 miles later. This was kind of a backup plan though as last spring we headed a little ways up 75-mile Canyon which we both wanted to further explore. 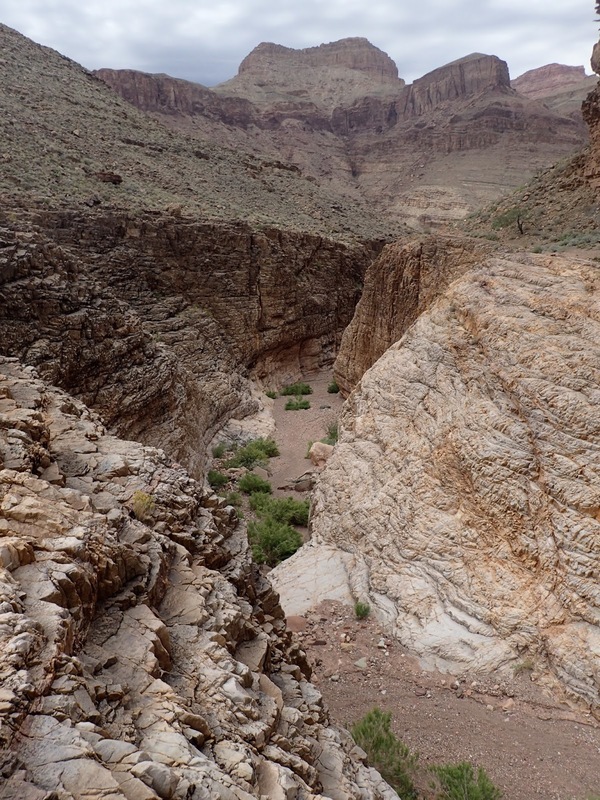 This side canyon provided easy cross country hiking, a rare feature in the Grand Canyon, and looked to provide a plausible route back to the Tanner Trail. The next morning brought some light cloud cover, but the temperatures were still very pleasant. The night was windy just after dusk, but was never cold and there were no bugs which was a huge bonus! We started hiking along the Escalante Route around 7 in the morning enjoying the easy rolling hills and some smooth trail. Looking back along the Escalante Route. The trail follows the ridge just behind the cliffs above the right side of the river. After an hour or two of smooth trail, the terrain became more broken and rocks started to fill the route ahead. The trail dropped down to the Colorado River, where we spent a few minutes talking with some hikers, and then headed on. Just a few minutes after leaving the hikers we saw some rafters coming down the river so we stopped again to watch them negotiate 73.6-mile Riffles. From here we decided to fill up our bottles the next time the trail dropped down to the river, then head up 75-mile Canyon. This was a great plan because we'd be able to chug a bottle or two at the river, then be fully loaded as we headed up and out 75-mile Canyon. We kept moving along the Escalante Route and soon found ourselves heading up 75-mile Canyon. No River. Oops. Our options was to follow the trail down to the river and fill up, which might add half an hour, then head back up or bank on the short trickle of water which we found up 75-mile Canyon last spring. Wasting no time we headed up 75-mile Canyon and within half an hour were able to fill up our bottle from the small trickle we found last spring. In hindsight, we should have planned a little better, but that's how thing go, so we were happy to have some water and continue up the canyon. As we climb up the Canyon, the cliffs along side up climbed as well and after an hour of hiking we were in a much deeper slot than we had begun the climb in. We began to realize that getting out of 75-mile Canyon to the Tanner Trail might not be as easy as it looked, but that didn't stop us from pressing on. Over two hour after leaving the Escalante Route, we hit a steep pitch that was a trick to scramble up. I went ahead and saw that our route was going to be more of the same which would really slow down progress. At this point, we'd realized that we weren't going to be able to climb out of 75-mile Canyon as we had intended (a big cliff was in the way) so we decided to head back down the canyon and hike out the New Hance Trail. We had hope we would have to head up the New Hance Trail because it looked to be 4-5 miles away from the Tanner Trail which would mean a short run on the road, but that wasn't the worst predicament so we headed back down 75-mile Canyon. We filled up at the bottom and then continued along the Escalante Route. This was the most rugged section of the route so it took us a while longer than we had intended. As it was we reached the New Hance Trail after while after 3 and began our slog to the rim. Looking back down Red Canyon. The trail is visible on the nearest hillside (we didn't use that section of trail). The New Hance Trail starts by following the creek bed up Red Canyon so we wondered along taking in the beautiful red slopes and following occasional cairn on our climb up. After an hour or so we realized that we hadn't seen any cairn for while so we decided to pull out the map and see where we were. We deduced that the trail had turned off a while back but that we could head up a side canyon and intersect it. We headed up the canyon for a quarter mile, then found ourselves blocked off by a 20 foot cliff. Fortunately the hillside still came down to the canyon where we were so we scrambled up the steep loose earth and eventually intersected the trail. Around this time we started to get an occasional sprinkle, just a few drops at a time which actually felt good. Hiking up the canyon, we watched the rim draw slowly closer and the clouds flit across the sky. Around this time we realized that we were much slower than we had hoped getting to the New Hance Trail and the darkness might catch up with us before we hit the rim. This didn't seem too concerning as we could bivvy another night in a pinch, but the nights are so bright in Arizona it likely would be an issue. As we continued on the rim still seemed quite a ways off and the chirping of crickets was beginning to fill the air. After watching a beautiful sunset on the rocks of the North Rim, we began to plug along in earnest. It was still plenty light to hike, but we were a little worried how far away the rim was. Also, there was still a short run left were I would take off for the car and Jacob would carry the packs. As you guessed, we finished second place to darkness so with over a mile(best guess) to go we entered some dark times. Actually, it wasn't bad at the start and the crickets played a pleasant melody to accompany our climb. Unfortunately, the New Hance isn't a highway like the corridor trails, so we soon found ourselves looking for cairns and double checking we were still on route. The darkness grew deeper and eventually we lost the trail. This sucked! There so many cliffs in the Grand Canyon, you can't just head straight uphill because you'd almost certainly find your way blocked by 100+ foot tall cliffs. Anyhow, after 5 minutes or so, we managed to re-find the trail and kept plugging away. The rest of the adventure was pretty mundane: we got lost two more time for a minute or two, kicked a lot of rocks, and reached the trailhead. At this point it was 7:45, so pretty dark, and I took off along the road to get the car. We had no headlight, so every time a car came by, I'd hop in the ditch and cover my eyes to protect my night vision. I made decent time but the sparse flow of traffic slowed things down a bit. 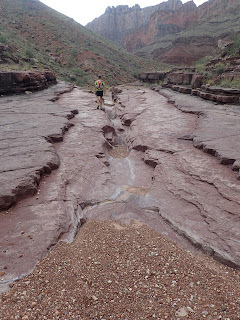 After a half hour of running I'd realized that it was definitely more than 4-5 miles to Lipan Point. It was a pleasant night, but when a car slowed and offered a ride, I was more than happy to accept. I quickly reached Lipan Point, thanked the driver and occupants, and headed back to pick up Jacob. With Jacob in the car, we decided not to head back to Flagstaff, instead eating some dried beans in the parking lot by the watchtower. This was great as we were able to boil some water and enjoy a nice meal! Then we headed out of the park, and pulled off on the first forest service road available. Some quick arranging and it was time to hit the sack! No better place to camp! Great reading your adventure. Awesome photos too! Looks like you and Jacob are making the most of the little bit of free time you have as full time students. Inspirational! 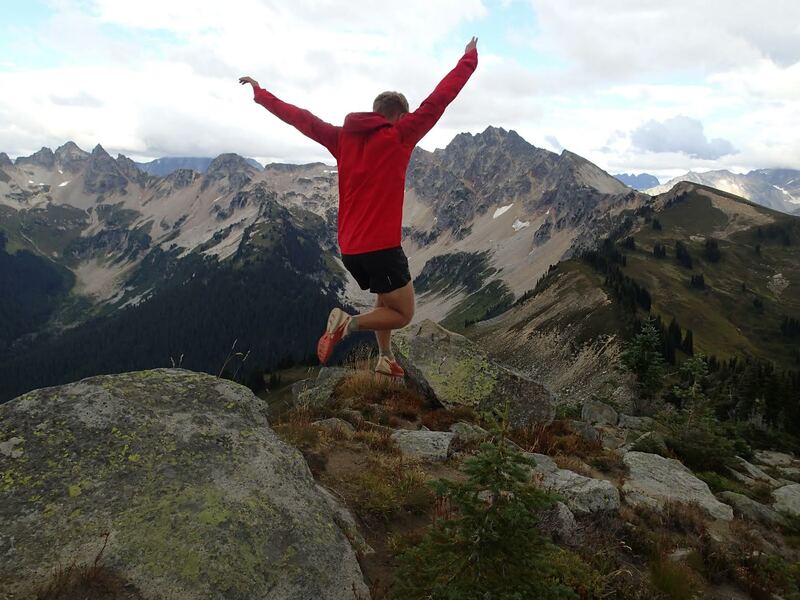 Keep up the adventures!